Journalism is a career of passion, according to Jenn Bernstein, a FOX61 anchor and political reporter. Bernstein spoke about her own path to her passion during the keynote address at High School Journalism Day at Southern Connecticut State University Oct. 21. More than 450 high school students and teachers attended the event, in its 33rd year, at the Michael J. Adanti Student Center. Hosted by the Journalism Department, the event included 18 workshops and a live drone demonstration in addition to the keynote address. Bernstein’s career started with gigs in the Buffalo and Albany television markets, before she transitioned to broadcast outlets in Philadelphia and in Connecticut. She has been with Fox61 since August 2014. Bernstein told students to be persistent, even in the face of rejections. And, she said, they need to learn new tools to stay competitive. “People who don’t want to pick up the camera are in for a rude awakening,” Bernstein said. Bernstein, in response to student questions, said she used to get nervous before going on air, but has become comfortable after gaining more experience. In the face of unexpected on-air problems, she said broadcast journalists learn to be flexible. “Try to be quick on your feet, and honest with your viewers,” Bernstein said. 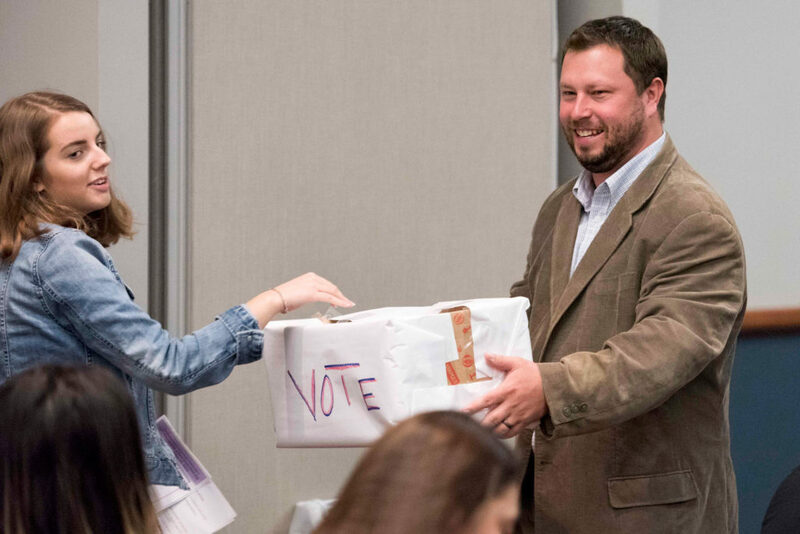 A high school student submits her ballot during High School Journalism Day, while speaker Paul Singley looks on. | Vern Williams photo. The Journalism Department polled high school students who attended High School Journalism Day about their choices for president. Students who voted supported Democrat Hillary Clinton 2 to 1 over Republican Donald Trump. Full results will be posted here soon. High school students interested in weighing in can vote in an electronic straw poll hosted by CTTeens. The electronic poll will remain open until 8 p.m. on Nov. 8, when polls close in Connecticut. High School Journalism Day is held each year to expose students to the journalism industry and working journalists. It is part of the mission of the department to help contribute to the growth and preparation of future journalists in the state. Each year, the faculty of the Journalism Department at Southern, as well as journalists throughout the state, conduct workshops geared toward providing writing, editing, photography, graphics, interviewing and career planning tips for prospective journalists. For more information and to see a list of past speakers, click here. Feature photo caption: High school students pose with Fox61 reporter and anchor Jenn Bernstein after her keynote address at the 33rd annual High School Journalism Day at Southern Connecticut State University Oct. 21. | Vern Williams photo.